Gov. J.B. Pritzker speaks at his victory party at the Marriott Marquis hotel in downtown Chicago. At his inauguration, Pritzker said he would work with the legislature to pass a balanced budget. Daily file photo by Noah Frick-Alofs. Pritzker outlined other progressive policy initiatives, including the legalization of marijuana and a $15 minimum wage. As one of his first acts in office, he said Illinois will join the U.S. Climate Alliance, a collection of states upholding the goals of the Paris Climate Accord. President Donald Trump withdrew the U.S. from the agreement soon after he assumed office. Pritzker also said he will protect workers’ union rights and strengthen Illinois’ infrastructure, including bridges, railways and roads. The success of these policies will rely in part upon the governor’s ability to work with state House Speaker Mike Madigan — now in his 18th term — the longest serving speaker of a state House in U.S. history. Madigan is considered by many to be one of the most powerful forces in Illinois politics, and his interactions with governors and fellow legislators have shaped much of the state’s recent political past. 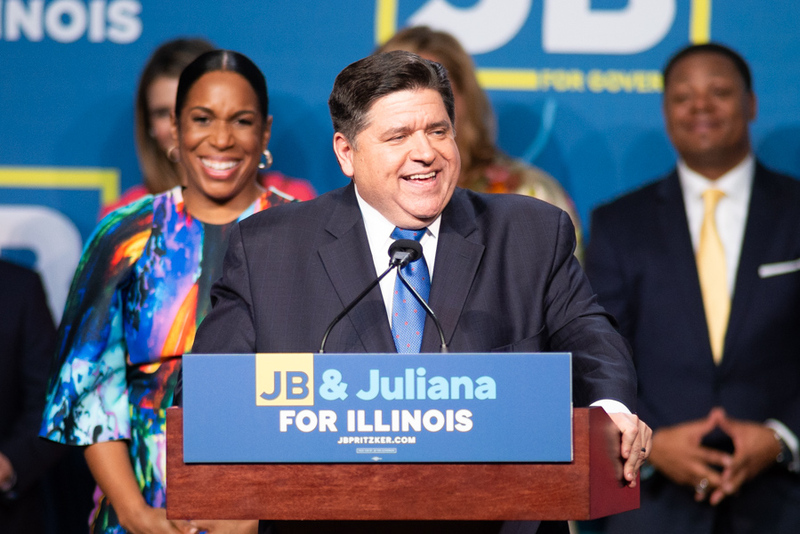 Weinberg sophomore Matthew de Boer, an organizing fellow for Pritzker’s campaign, said he hopes the first thing on the new governor’s agenda is lessening Illinois’ debt. “The most pressing issue is establishing a tax plan: a real, cohesive, actual tax plan that can get passed in the capital,” de Boer said. Pritzker’s inauguration — along with those of Lt. Gov. Juliana Stratton, Comptroller Susana Mendoza, Attorney General Kwame Raoul, Secretary of State Jesse White and Treasurer Mike Frerichs — means that Democrats now have control of every statewide office. The “incomparable” Stratton, as described by Pritzker, drew much applause from Monday’s crowd as she became the first African-American lieutenant governor in Illinois history. Pritzker said his cabinet will be the most diverse of Illinois’ history, bringing to the table backgrounds and experiences that he said he does not have.